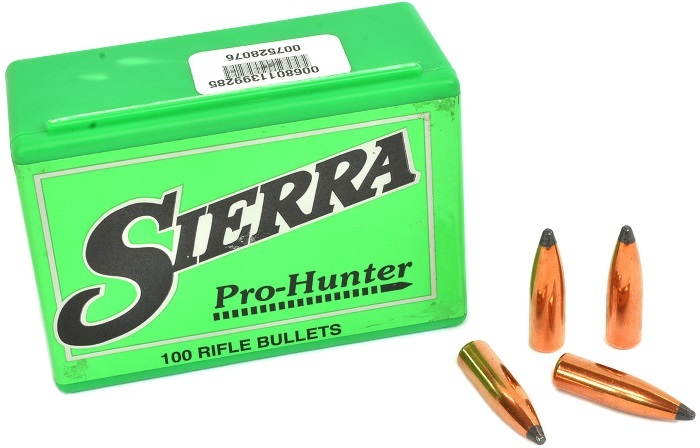 About Sierra Pro-Hunter® Bullets - All bullet shapes in this classification are flat base, and they include round nose (RN), semi-pointed (SMP), spitzer-pointed (SPT), flat nose (FN), and with a hollow point (HP/FN). A few bullets in this category have Sierra's proprietary Power Jacket to enhance bullet expansion in game animals when fired from medium-velocity cartridges. All these bullets have medium to heavy weights in each caliber, and they are designed for a combination of penetration and expansion in medium and heavy game animals for their calibers. The traditional, flat base design of the Pro-Hunter® has been skillfully blended with Sierra's world-famous accuracy. Our custom-tapered Pro-Hunter® jacket design helps assure maximum expansion, optimum weight retention and deep penetration for game-stopping, one-shot performance. 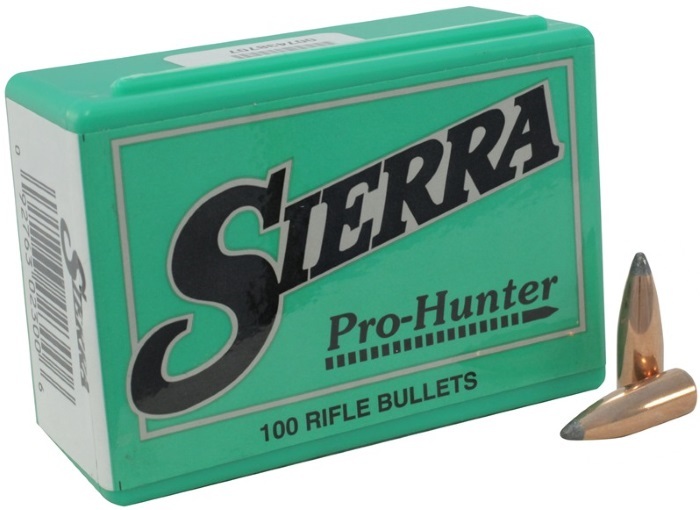 As with other Sierra manufactured bullets, Sierra Pro-Hunter Rifle Bullets come in various calibers, diameters, and grains. Unique to these bullets is the traditional flat base design that skillfully balances the accuracy known by competitive shooters from around the globe. This particular bullet has a custom tapered jacket that ensures maximum expansion as well as optimum weight retention. Another popular feature of these bullets is the deep penetration. This capability produces the clean, one-shot kill that is so vital to responsible and seasoned game hunters. Regardless of the option chosen, all Sierra bullets are made from quality materials and workmanship. 10% Discount on Large Orders of Projectiles! 5 or More Packets of HORNADY or SIERRA Projectiles! For years shooters have associated accuracy and superior ballistic performance with one name more than any other--Sierra. On the range or in the field, Sierra bullets offer that extra margin of performance that shooters can depend on. Today Sierra offers over 160 different rifle and handgun bullets to satisfy nearly any need. No wonder shooters around the world prefer Sierra. 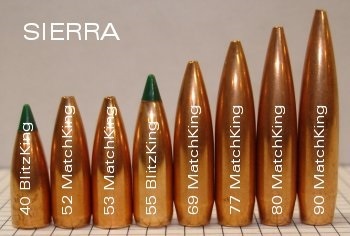 Sierra also uses several basic shape designs for rifle bullets, although some features of different shapes may be incorporated into a single bullet. Shape and characteristic features easily distinguish each design. The most popular are described below. Hollow Point is a bullet shape used for the MatchKing bullets as well as a number of Varminter, GameKing and Pro-Hunter bullets for hunting. The Hollow Point shape has an opening in the nose, which depending on the use of the bullet, may be designed for complete fragmentation, controlled expansion, or no expansion at all (MatchKing). With the wide range of Hollow Point bullet performance capabilities, proper bullet selection for a particular use is crucial to ensure the desired performance in the field. Spitzer is a term taken from a German word that means sharp pointed. The spitzer shape is readily identified by a characteristic long ogive point shape closing with either a small diameter exposed lead tip or with the proprietary compound tips in Sierra's BlitzKing bullets. Spitzer bullets may have either a flat base or a boat tail and have much higher ballistic coefficients compared to the traditional round nose or flat nose bullet shapes. The spitzer shape with either a flat base or a boat tail has become the "standard" for hunting bullets today. Boat Tail bullets have a smaller diameter base, a shape resembling the configuration of the stern of a sailboat. This shape significantly reduces the base drag on a bullet, giving boat tail bullets a significantly higher ballistic coefficient than flat base bullets of the same weight and point shape. Thus, boat tail bullets have lower sensitivity to crosswinds, higher retained velocity downrange, flatter trajectories, and higher energy and momentum delivered to the target than their flat base counterparts. Semi-Point is a bullet shape designed to provide heavy bullet weight within a given bullet length, and at the same time provide a ballistic coefficient higher than either the flat nose or round nose bullet shapes. The semi-point shape features a nose with a tip of exposed lead that is larger in diameter and more rounded than the spitzer shape. This shape sometimes works well in rifles having twist rates too slow to stabilize the longer spitzer or hollow point bullets of the same weight. Full Metal Jacket (FMJ) bullets are easily recognized by the jacket, which covers the entire bullet forward of the base with only a small amount of exposed lead at the base. Sierra's FMJ bullets also have the boat tail configuration. When used at reduced velocities, Sierra's FMJ bullets are nonexpanding in light game, and often are an ideal choice for varmint or predator hunters wishing to minimize pelt damage. FMJ bullets also allow hand loaders to effectively duplicate 5.56 mm and 7.62 mm ball ammunition for use in military style rifles. Roundnose bullets are a traditional design often used by hunters in areas affording shots at game only at short ranges. This bullet shape is easily recognized by a large, rounded, exposed lead tip. The large amount of exposed lead at the nose causes positive expansion of these bullets at moderate velocity levels. Flatnose bullets are designed especially for rifles with tubular magazines. The large diameter meplat greatly reduces the chance of recoil-induced ignition of cartridges in the magazine when the rifle is fired. A large amount of exposed lead at the nose of these bullets causes positive expansion in game at moderate velocity levels, especially those with a Sierra Power Jacket. The Power Jacket has a series of "skives" cut into the mouth of the jacket. The skives ensure positive and controlled expansion of the bullet at moderate velocities and are used in several Sierra handgun bullets as well as flat nose rifle bullets.